Los Angeles has a city-wide rail system?!? Yes and it's clean, safe efficient and growing. In fact, you can plan great train trips through Los Angeles using the metro rail system, or visit the best attractions in Los Angeles via rail. Here is what you need to know to get to over three hundred destinations using the LA Metro Rail system; from best restaurants in LA to hotels to farmers markets, museums and health and beauty spas. How many lines are there and where do they go? Where do I buy my ticket to ride? Are there discounts and special passes? How do I get a TAP card? Can I take my bike on the trains? Can I get to LAX via metro rail? Does Burbank Airport have train service? 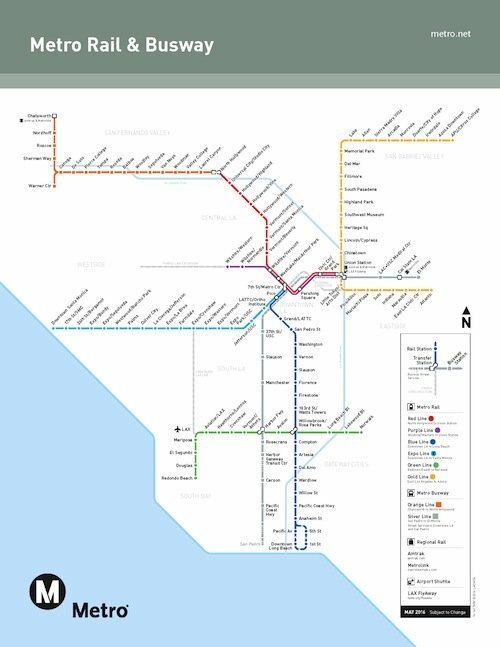 There are six metro rail lines in the Los Angeles area. Take the Gold Line to Pasadena or East Los Angeles. The Red Line gets you to Hollywood and Universal City. Use the Purple Line to go from Downtown L.A. to Koreatown. Take the Blue Line to Long Beach, the Green Line to Los Angeles International Airport. The new Expo Line connects downtown to USC, the museums and attractions of Exposition Park, Culver City and Santa Monica. Download Free Metro Rail Map. Red Line - Subway: Serves North Hollywood, Hollywood, Thai Town, Chinatown and downtown L.A. End-Stations are North Hollywood and Union Station. Gold Line - Light Rail: Serves Azusa, Irwindale, Duarte, Monrovia, Arcadia, Pasadena, Little Tokyo, Chinatown and East Los Angeles. End-Stations are Citrus College and Atlantic. Purple Line - Subway: Serves Downtown and Koreatown. End-Stations are Union Station and Wilshire/Western. Blue Line - Light Rail: Serves Downtown, Watts, and Long Beach. End-Stations are 7th Street Metro Center and Long Beach Transit Mall. Green Line - Light Rail: Serves Los Angeles International Airport, the South Bay and Norwalk. End-Stations are Norwalk and Redondo. Expo Line - Light Rail: Serves downtown Los Angeles, Exposition Park, USC, Culver City and Santa Monica. End-Stations are Downtown Santa Monica, and 7th Street/Metro. Download Free Metro Rail Map. How much does it cost to ride the Los Angeles Metro Rail? The one way fare is $1.75 and includes free transfers to other Metro Rail lines for up to two hours on a one-way trip. Seniors and disabled travelers pay only $0.75 per ride. Seniors age 62 and over and disabled riders can take advantage of a reduced off-peak base fare of $0.35 on weekdays from 9 AM-3 PM and 7 PM-3 AM, and all day on weekends and federal holidays. A better deal is a Day Pass, which is $7.00 and is good for all day, system-wide travel. Senior/disabled and student day passes cost $2.50. An even better deal is a weekly pass, which only costs $25. Monthly passes are $100. Senior/disabled monthly passes are $20, college and vocational student monthly passes are $43. K-12 monthly passes cost $24. Where do I buy my Metro Rail ticket? Buy your fare before you board the train. Self-service ticket machines with step by step instructions are located at every station. There are NO paper tickets. You must have a TAP card (Transit Access Pass) to ride. A TAP card functions like a Metro debit card. You add value to your TAP card by buying either a single one-way fare, or a day, weekly or monthly pass at any self-service ticket machine. If you do not have a TAP card you can purchase one at the automated vending machines in each Metro Rail station. The machines accept cash, credit or debit cards. A TAP card costs $1.00 at station vending machines, $2.00 on buses and retail locations. It is a blue plastic card that you must have to ride the Metro system. Every ticket machine at the Metro Rail stations dispenses TAP cards. To start, push any button on the self service ticket machines. Select your fare and make your payment. You will be issued a plastic, reusable TAP card loaded with your fare. If you already have a TAP card, touch it to the big blue circle that says TAP on the vending machine. Select your fare and make your payment. Touch your TAP card to the target again to load your fare. Blank TAP cards are not available; TAP cards are only sold together with a fare or pass. How do I use a TAP card to ride the Metro Rail? Once you've added value to your TAP card you are ready to ride. Tap your TAP card on the blue circle at the turnstile before you board. You'll hear a "beep" sound that tells you the card is valid. As long as you have "money" on your card you can use it to board any Los Angeles Metro Rail line. Don't forget to always tap your TAP card before you board the train. You must also tap your TAP card when making a free transfer. Fare Inspectors have electronic readers that let them know if the TAP card is valid. It is not enough to just have money on the card, you MUST ALWAYS tap you card before riding the train. If you are caught without a paid fare, the fine is a hefty $250 plus you could be pressed into 48 hours of community service. Where else can I get a TAP card? You can buy a TAP card at any Metro Customer Center such as Union Station and at 400 other locations such as markets and convenience stores. Click the tap cat picture for a complete listing. The TAP card costs $1.00 at station vending machines, $2.00 on buses and at retail locations. You can also buy a TAP card online at www.taptogo.net. You will receive your TAP card in the mail. TAP cards are also available on Metro buses when purchased with a Day Pass. The TAP card makes life easy. You don't have to dig through your pockets looking for exact change or battle a machine that is too fussy to accept your wrinkled dollar bill. You'll never miss your train if there is a long line at the ticket machine. And it's eco-friendly; it saves trees by reducing the tons of paper passes and stamps. Los Angeles Metro Rail trains run from 4 or 5 in the morning until midnight or 1 AM, depending on the line. Friday and Saturday nights, all trains operate until 2 AM. Trains are frequent throughout the day, usually running every 5-10-15 minutes, depending on the line. Check timetables here. How do I buy weekly and monthly passes? Passes can be bought at ticket vending machines located at all stations. You must have a TAP card to purchase weekly or monthly passes. Passes can also be purchased at Los Angeles Metro Rail Customer Centers and other locations such as supermarkets, convenience stores and check cashing outlets. Search all sales locations here. Reduced fare monthly student passes are available with a photo I.D. and proof of eligibility. Seniors and disabled travelers are also eligible for reduced fare monthly passes. The Los Angeles Metro Rail Help Line number 323 GO-METRO (323 466-3876) is actually very helpful. Call from anywhere in the city. Talk to a live local human being. Tell them where you are and where you want to go, and they'll tell you which train or bus to take and when it's due. If you're going to be in town awhile, put this number on speed dial. Bicycles are welcome at all times on Los Angeles Metro Rail. Parking. Really, we're doing our best to get you out of your cars, but because much of L.A. is still not served by Metro Rail, locals may want to drive to their stop. There are free on site parking lots at most Metro stations, with the exception of the downtown and Hollywood stops. For people boarding the Metro system from the San Fernando Valley, the North Hollywood Red Line station has 803 parking places. Universal City is also a good bet for Red Line travelers, with 779 spaces. On the Blue Line, the Willowbrook station is the parking lot king, offering 975 spaces. The Artesia station has 292 parking spaces, while the Willow Station in Long Beach has 879 spaces. The Expo Line offers 585 free on site parking spaces at the Culver City Station and 476 free spaces at the La Cienega/Jefferson station. Because the Green Line is primarily a suburb-to-suburb commuter line, its stops have giant parking lots. There are 2050 parking spaces at the Norwalk stop, the eastern end of the line. At the Green Line's western end station, the Redondo Beach Station has 403 parking spots. For the perfect Electric Travel Experience, you can now charge your electric car at these Metro Rail stations: Union Station, Azusa Downtown, Irwindale, Duarte, Monrovia, Sierra Madre Villa, Universal City, El Segundo and Willow St.
Can I get to and from LAX via Metro Rail? YES! - click HERE for more information.